The first piece of advice given to people considering buying a ‘first’ telescope is always to contact your local astronomical society and go along to one of their meetings. All astronomers will be happy to let you have a look through their telescopes to help you decide what to buy. Before looking at the range of telescopes that is available, there are two important factors to be considered. First: how much can be afforded to buy the telescope and second what is it primarily going to be used for. The worst possible choice is the one that never gets used. A telescope that is too complicated and expensive or too cumbersome to set up will spend most of its time at the back of a shed or garage and never be used. 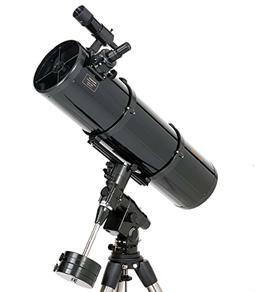 The first telescope should be easy to set up, easy to use yet give impressive views of the sky. Very few astronomers get rid of their first telescope when they upgrade to a larger one, they keep it to take when they go out to observe. Does the telescope need to be portable? First guideline is - do not buy a cheap telescope from a high street shop. 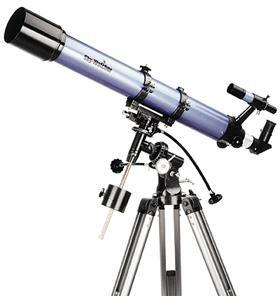 The minimum sum required to purchase a new ‘first’ telescope that is worth having for astronomy must be in the region of £150 to £200 (second hand telescope will be less). This sounds a lot of money but it will buy a very useful telescope that will not be a disappointment and will not be confined to the back of the shed or discarded in the attic. Second guideline – a first telescope should have a minimum aperture of at least 90mm for a refractor or 130mm for a reflector if finances permit. This will ensure that the instrument can capture enough light to enable faint objects to be seen. Third guideline – The telescope should have a focal length of about 1,000mm for a general purpose instrument. About 750mm will be best for a more specialised wide field telescope for deep sky objects. A longer focal length may be considered if planetary studies are to be the main purpose for the telescope. There is one final point to for consideration. 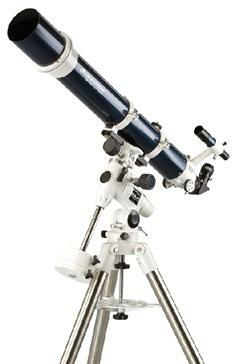 if the telescope is to be used for astro-photography then it should be mounted on an ‘Equatorial Mounting’. This is required if longer exposures are to be taken with a camera fitted in place of the eyepiece. There is also a misconception about the term ‘Magnification’. Strictly speaking magnification is not an attribute of the telescope it mainly depends on the eyepiece being used. A telescope of a specific focal length will produce an image of a specific size and this cannot be changed. For example a telescope of a certain focal length may produce an image of the full moon 10mm in diameter. A longer focal length will produce a larger image and a shorter focal length will produce a smaller image. The eyepiece is then used, much like a microscope, to magnify that image. Starting with a larger image from a long focal length telescope will allow an eyepiece of a certain focal length to produce a more detailed and effectively a higher magnification, than the same eyepiece used on a telescope with a shorter focal length. To summarise, if the craters on the Moon or the cloud bands on Jupiter are to be studied then a telescope with an effectively long focal length should be sought. A shorter focal length telescope will be more suited to wide field views of the stars. A good all round first telescope should have a focal length of around 1000mm to 1200mm. There a two fundamental designs for telescopes these are Refractors (telescopes that use a lens as the main optic to capture light and focus it into an image). The second type of telescope is the Reflector that use a concaved mirror to gather light and direct the light into a focused image. Reflecting telescopes are generally cheaper than the equivalent sized refracting telescope. This is because they use a mirror as the main optic and not a more expensive lens. A mirror only has one surface to be ground and polished but the typical refractor, that has two or sometimes three lens elements, has four or up to six surfaces to be ground and polished. The cheapest and simplest reflecting telescope is a Newtonian tube assembly mounted on a Dobsonian mount. The mount is a simple Alt azimuth with a turntable for rotation and a trunnion for up and down movement. These are very easy to set up and simple to use. This type of mount is used by many amateur astronomers who build their own telescopes because it is so simple to make. Because the Newtonian has a secondary mirror at the top of the tube there is a small loss of light so a 130mm will give a just slightly brighter image than a 100mm refractor. Discontinued but can be obtained second hand. Other manufacturers may still have a similar range. The owner can soon master the technique of moving the telescope manually to track an object as it appears to move across the sky. The usual method is to move the telescope towards the east until the object is at the east side of the field of view. As the image is optically reversed this means the object has to be moved to the right of the field of view. The object is then allowed to drift across the field of view until it is about to disappear. The telescope is then moved again. The Newtonian tube assembly can also be fitted to an equatorial mounting. This does make the telescope more expensive but can make it easier to track objects across the sky. This combination gives the advantage of a large aperture telescope on a mount that can easily be driven to track objects. Most Dobsonian telescopes use a fairly long focal length tube assembly whereas a shorter focal length is generally favoured for the equatorially mounted Newtonian. Most of the larger manufacturers have a similar range. As previously stated the main advantage of an equatorial mounting is in its ability to track an acquired object across the sky using just one drive. The mount has two rotating axes. In the image above the shaft with the optical tube at one end and the counter balance weight at the other is called the Declination (Dec) axis. This is used to elevate the telescope or move it down. The axis that is parallel to the telescope tube is called the Right Ascension (RA) and is used to move the telescope from east to west or west to east. The object to be observed is first found by pointing the telescope, by eye, in the approximate direction. Most equatorial mounts have a clutch release mechanism that allows the telescope to be slewed freely with the drives disengaged. With the clutches still released the object is located at the centre of the finder scope (the small telescope attached to the main tube). The RA and Dec drive can then be engaged by tightening the clutches. The required object should be visible in the main telescope eyepiece. Using the RA and Dec drives the object can then by centred in the main telescope. Once centred, the object can be tracked by adjusting the RA drive only. Most basic equatorial mounts are supplied with manual drives on RA and Dec. Electric motor drives can be fitted when purchased for additional cost or can be fitted as upgrades at a later date. An electric drive is not necessary on the Dec axis but a driven RA is very useful to save continual manual tracking of objects being observed. With the mounting set up approximately level and closely aligned on the north polar axis tracking for in excess of 20 minutes without manual adjustment is easy to achieve. Refracting telescopes are generally more expensive than reflecting telescopes but they do have some advantages over their cheaper cousins. Firstly the main optic (the lens assembly) is mounted in the tube by the manufacturer and should remain there untouched for the life of the telescope. The mirrors of reflecting telescopes do need to be collimated from time to time. Being enclosed in a tube the internal surfaces of the lenses can stay clean for a long time and may never need cleaning. The outer surface of the lens assembly may need a gentle clean every few years but this is a relatively easy thing to do. There is also an optical advantage due to the requirement of a reflecting telescope to have a secondary mirror in the light path to direct the gathered light out of the tube to a viewing position. This secondary mirror is an obstruction in the light path and reduces the amount of light available to the observer. A short focus reflecting telescope needs a larger secondary than a long focal length instrument. The presence of the secondary mirror also slightly reduces the quality of the image compared to a refracting system that does not require a secondary optic and is therefore obstruction free. For these reasons the minimum aperture for a refracting telescope should be 90mm whereas 130mm is recommended for a reflecting telescope. 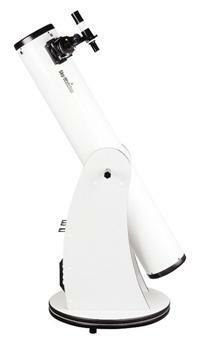 This telescope represents the minimum specification for a first refracting scope for a beginner. It has an aperture of 90mm and a focal length (FL) of 1000mm. It is supplied with a tripod fitted with a basic EQ2 (equatorial mounting), two eyepieces, even a camera adaptor. The MRP is about £160. Most of the larger manufacturers have a similar range. The telescopes in these ranges are typically supplied on a tripod and with an equatorial mounting. They usually have two eyepieces (25mm and 10mm) and sometimes include a Barlow Lens. All are supplied with a 90° Star Diagonal. This is a mirror set at 45° to direct the image into a comfortable position for viewing through the eyepiece. 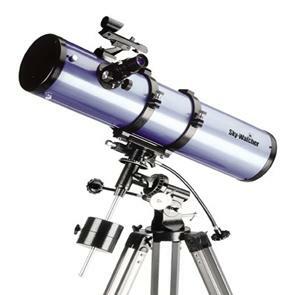 A first telescope must be easy to use, portable enough to move around and set up and be within a modest budget. The budget available is important but if possible at least £200 should be spent on a new telescope or the pro-rata amount for a second hand instrument (say £100 for a telescope that costs £200 new). Avoid the models that are sold in high street stores as they tend to be poor quality. MEADE, CELESTRON, ORION, SKY WATCHER, TAL, KONUS and BRESSER. Suppliers of these telescopes can be found in the adverts in popular astronomy magazines such as ‘Astronomy Now’ and ‘Sky at Night’. Modern telescopes bought from reputable manufacturers are all good quality these days so it is difficult to choose from the huge and varied selection available. The choice between reflecting and refracting telescopes is really a matter of choice, bearing in mind the advice given previously regarding comparative aperture size. A reflector should, if finances permit, be over 90mm and a reflector over 130mm. A general purpose telescope should have a focal length of around 1000mm. An equatorial mounting is desirable as it will make tracking an object easier. Do not spend too much money on a large or complex telescope as a ‘first scope’. Using the telescope on the cold damp winter nights (which are the best for observing) does not suit everyone so a starter scope will provide a relatively low cost trial for the hobby with not too much to lose. Like most equipment bought for a hobby the telescope can always be upgraded later. The smaller examples are usually supplied with a Red Dot Finder or a 30mm aperture finder scope whereas a 50mm aperture finder telescope would be better but this can be upgraded later. The cheapest equatorial mountings are usually good enough to start out with but once the new astronomer becomes more discerning a heavier and more robust mounting can be fitted to make the telescope more stable. This will be required if astro-photography is to be an interest. There are other telescopes available with 60mm to 70mm aperture that are not bad if only a small budget is available (£60 to £100). Their capability is however really limited to observing the Moon or the moons of Jupiter. They may also just be able to give a glimpse of Saturn’s ring system on a good night. If anyone is considering buying a telescope for someone as a Christmas present then the best advice is to contact a local Astronomical group. The members will always give advice freely and usually offer a look through their telescope and those of other members so a practical comparison can be made. Almost any telescope has the ‘wow’ factor when first used, particularly if used to look at the Moon. However if it is too small it may soon become a disappointment if the wonderful objects talked about in books and magazines cannot be seen. This is why a minimum aperture is recommended. The extra cost of a worthwhile telescope can be made more acceptable when the instrument is used by the whole family and friends. Almost everyone will want to have a look when it is set up. The details of the types of telescopes mentioned in this article can be checked out on websites and can be purchased through mail order. They do need to be assembled but this is generally an easy task. Advice for ‘Assembling a First Telescope’, ‘Setting up a new telescope’ and ‘Using a telescope for the first time, is given in other articles in this series.